← Is #Setlock good for Sherlock? 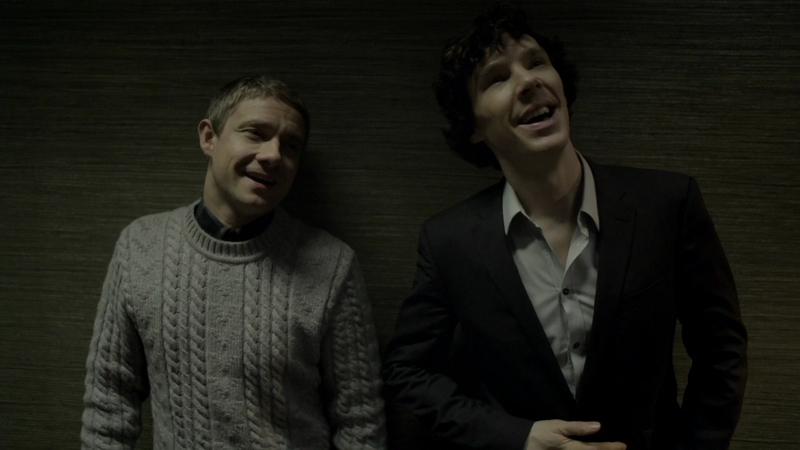 Everyone knows that when it comes to Sherlock it is, if anything, one of the wittiest shows on television. The show’s terrific trio of writers, Steven Moffat, Mark Gatiss, and Stephen Thompson, pour their heart and soul into making Sherlock a brilliant TV series, and I think we can all agree that they’ve done just that. Because there are just far too many fantastic one liners to choose from, I’ve limited the pool to simply the first episode of Series One for this time around. I can’t tell you how many times I’ve watched A Study in Pink. I think I have the entire episode memorized (Mostly because I force everyone who visits my house to watch it). With just using A Study in Pink, it’s still incredibly difficult to just pick five quotes. I have done my best to choose the most iconic of them all. Did we miss your favourite A Study in Pink quote? Leave it in the comments! “Nothing happens to me.” Followed by dramatic music and ‘SHERLOCK’ appearing across the screen. Great show, but the gifs in this post are insanely annoying. I´am in shock. Look, I´ve got a blanket!